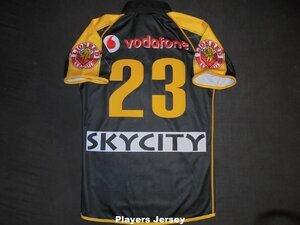 This jersey was worn during the Warriors match at Westpac Stadium in Wellington. The design was based off Wellington's provincial team the Orca's home colours. 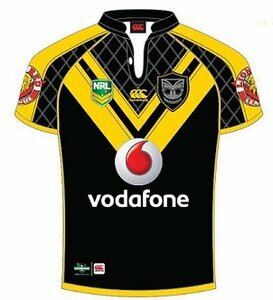 The design for this jersey was accidentally leaked online by a supplier. At the time it wasnt known whether the jersey was actually going to go into production. After a lot of demand CCC announced that the jersey would be made available to the public and it went on to become one of its top sellers for the year. OFFICIAL REPLICA - Quite a popular jersey. Still see many online for sale that havent been worn at all. Think most people thought it would be a collectors item but the number of these that were released made them too common. Plenty around if you are after one. Even signed ones arent too hard to get due to the number that were signed up. 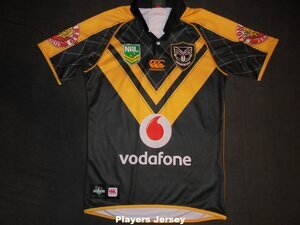 PLAYERS JERSEY - The players jerseys were the same as the replicas but with a taper and yellow number. They would also for the first time include a GPS pocket. The pocket was stitched on under the back neck hem and had a little sponge included for comfort. Because of the added expense of not only making a tapered jersey but also including a GPS pocket players jerseys were next to impossible to get from suppliers and all jerseys were given to the club. 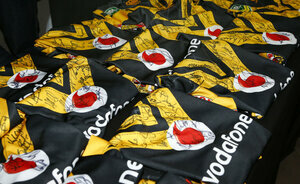 All jerseys were given to the players who wore them with the higher numbered jerseys going to Reserve Grade players.